Difference between revisions of "NB PolicyType"
# Utilities to manage the modules and associated configuration files within the 'policy store'. The [http://taiga.selinuxproject.org/~rhaines/NB4-diagrams/2-high-level-arch.png High Level SELinux Architecture] diagram shows these components along the top of the diagram. The files contained in the policy store are detailed in the [[PolicyStoreConfigurationFiles | Policy Store Configuration Files]] section. 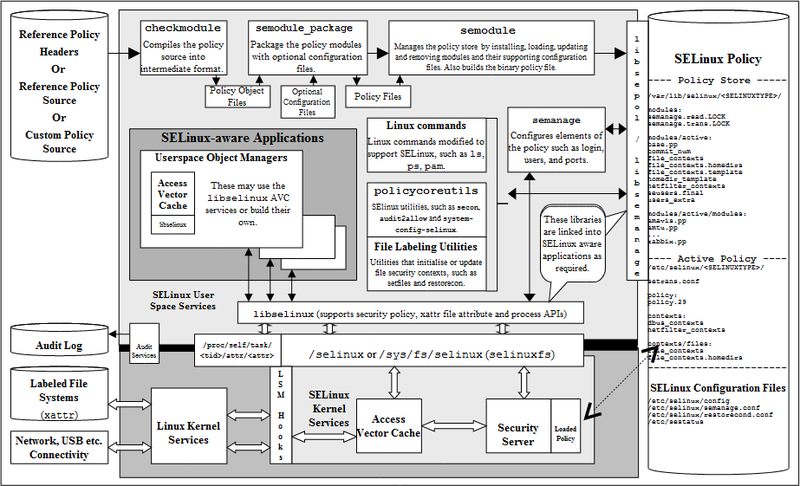 The [http://selinuxproject.org/~rhaines/NB4-diagrams/2-high-level-arch.png High Level SELinux Architecture] diagram shows these components along the top of the diagram. The files contained in the policy store are detailed in the [[PolicyStoreConfigurationFiles | Policy Store Configuration Files]] section. The policy language was extended to handle loadable modules as detailed in the [[KernelPolicyLanguage#Policy_Support_Statements | Policy Support Statements]] section. For a detailed overview on how the modular policy is built into the final binary policy for loading into the kernel, see "[http://securityblog.org/brindle/2006/07/05/selinux-policy-module-primer/ SELinux Policy Module Primer]. The policy language was extended to handle loadable modules as detailed in the [[PolicyStatements | Modular Policy Support Statements]] section. For a detailed overview on how the modular policy is built into the final binary policy for loading into the kernel, see "[http://securityblog.org/brindle/2006/07/05/selinux-policy-module-primer/ SELinux Policy Module Primer].